When our son was a pup, we bought a new refrigerator. When they peeled away the outside box, it was protected by large sheets of styrofoam. A child’s dream come true! Not the new appliance…the trash. ANYHOW…If memory serves me correctly, I think he was about 8-9 years old. 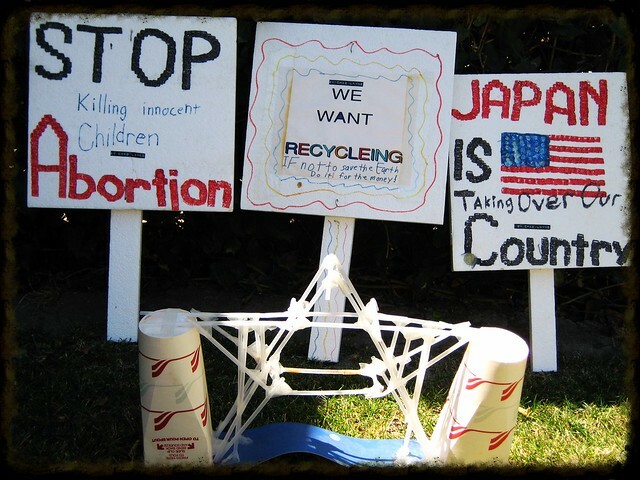 He gathered up the sheets of styrofoam (Not an easy task for a child), cut out sets of squares and narrow rectangles, grabbed some tape, a stapler, paper, glue, markers and went to work making protest signs. He actually marched them up and down the street we lived on. We did not tell him what type of signs to make or what they should say. While we did sensor any form of entertainment…He was never sheltered from news reports. Whatever was happening in the world, he kept informed. Amen! Sometimes I am left speechless at the things “Christians” deem important enough to speak out about. I cannot begin to understand (nor do I care to) the “logic” they put into some of the concepts they deem “evil” or the energy they muster up for the protest. Meanwhile we watch our pastors fall from grace, by record numbers, due to adultry as Satan gets a grip on them and we’re too busy speaking out about a green logo on a paper cup to take the time to pray God’s protection over them and their families. THAT, my friend is evil. We allow the enemy to prowl through our churches and homes as a wolf in sheeps clothing seeking the weak to devour while we are too focused on a cup of coffee to pray over them for God’s wisdom and guidance to be prominent in their lives. Yes, THAT, brothers and sisters, is indeed evil. The world is chaotic with persecution, beheadings, child abuse, etc. and there are indeed things we need to speak out about…the cross, the blood which was shed, the gospel, the process of sanctification. I do not believe for one minute God gives a rats hiney about a cup of coffee. …The problem is, it detracts from those who are actually trying to be about the Kingdom business. Even here, half a world away, in a Muslim country where Christmas is practically a nonfactor, I have had someone ask me why Christians are so mad at Starbucks. Here I am trying to share the love of Christ with my neighbors and you fools are stirring up a furor that reinforces the negative stereotypes they have about Christianity that I am trying to break down. You children, please be wise, that I might better answer my critics. Please, please, stop being so stupid. Proverbs 27:11(NLT) Be wise, my child, and make my heart glad. Then I will be able to answer my critics. Remember…It’s time to be about Kingdom business.